UNO DJs | House Cat | Dizzy Daryl Brad Mayes | Liam Howarth + more. Boxing Day at the Barwon Heads Hotel has been a mainstay destination for many years. So once the opportunity arose to take the reigns, we thought it would be best to take it to a whole new level and transform the carpark into the newest boutique music festival site! From the team behind Coastal Jam, UNO DanceClub, Bloom and many more of your favourite regional Victorian destination and events – bring you the newest and biggest venture to date! 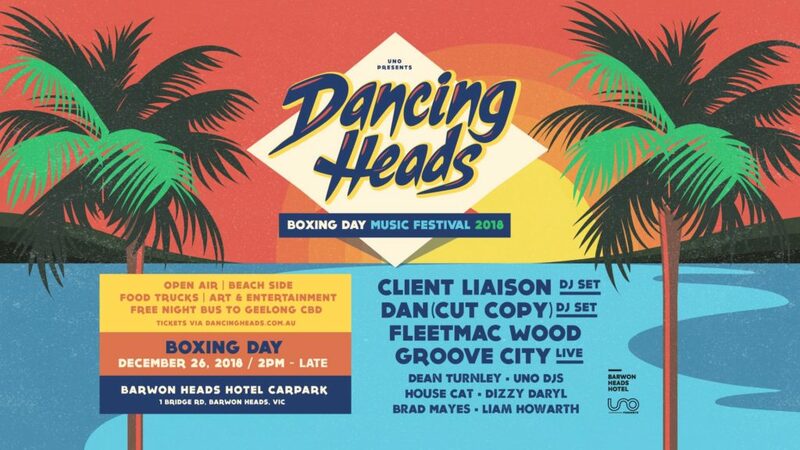 Nestled between the beach and the iconic Barwon Heads Hotel is your sun-drenched escape, your Boxing Day festival destination for years to come – featuring arts and entertainment, food trucks, cocktails, craft beer and your crew – this will be the perfect way to kick off your post-Christmas celebrations, this year, and every year! * Sign-up below to stay in the loop! Does your birthday fall on December 25th or 26th? Let us help you celebrate, with a free ticket! Inbox the page to reserve your place! * We’ll be providing complimentary buses to the Geelong CBD from event completion onwards every half an hour until required. * Follow the link below and get a $30 discount on the booking price! * Dancing Heads will be hosting multiple afterparties.